The part-time Point Loma Nazarene Evening MBA program at Fermanian School of Business is designed to be completed in 24-28 months by working professionals. The curriculum includes 12 core business courses and two electives. Classes are held at the Mission Valley Campus two evenings a week, either Monday/Wednesday or Tuesday/Thursday. Students can begin the program either during the spring or summer semesters. The part-time Point Loma Nazarene Evening MBA program is composed of 12 core business courses and two electives for a total of 42 units. Instead of choosing electives, students may also select from four concentrations: Innovation & Entrepreneurship, Healthcare Management, Project Managements, or Organizational Leadership. The program follows a cohort structure, which places students in small groups to move through the courses. Students will also have the chance to attend Executive Development Events during their time at Fermanian. A recent count showed that Fermanian has 76 MBA students in total, with a class size of around 20. Fermanian School of Business will charge $845 (per unit) for the 2018-19 academic year. 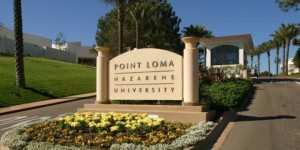 Applicants to the Point Loma Nazarene Evening MBA program must have completed a four-year degree or its equivalent and graduated with a minimum GPA of 3.0 or higher for admission. Students with lower GPAs may still be eligible for admission, but should contact the school for more details. To apply to the part-time MBA program at Fermanian School of Business, applicants must submit an online application with a $50 fee; office undergraduate transcripts; a personal essay; GMAT score; a résumé; two professional recommendations. Non-business majors may be required to take prerequisite courses in accounting, finance, statistics and Excel.